heart on this day after Valentines Day. 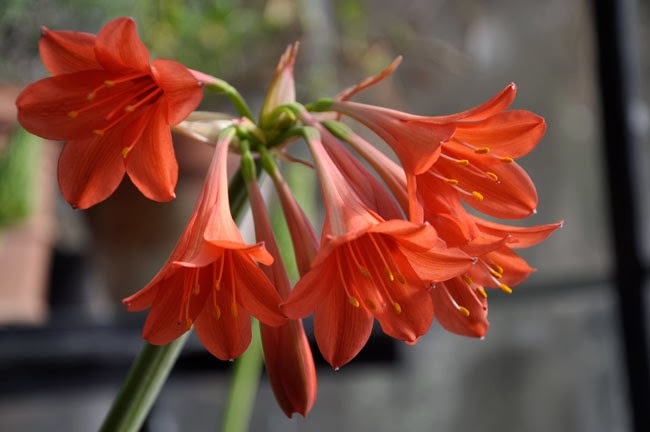 A relative of the Amaryllis, the Cyrtanthus is not that common anymore, unless, of course, you live in South Africa, which is where this bulb is from. 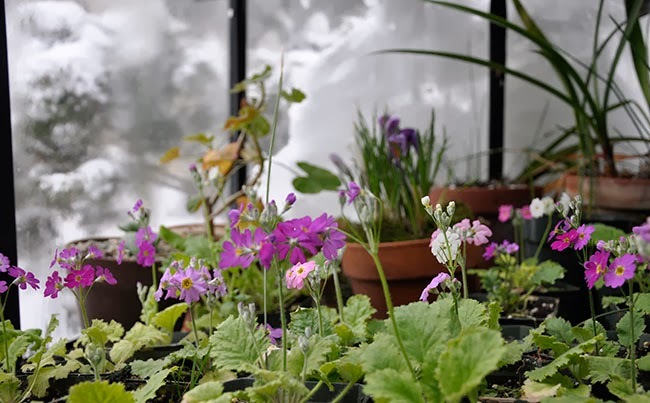 Primula malacoides seedlings, or the Fairy Primrose – just beginning to bloom. An old florist plant which is not that common today. I hope these grow larger, but they are making some great strides in growth, even during this dark, cold, winter. I positioned a few flowering plants onto one of the back benches, just to photograph them. 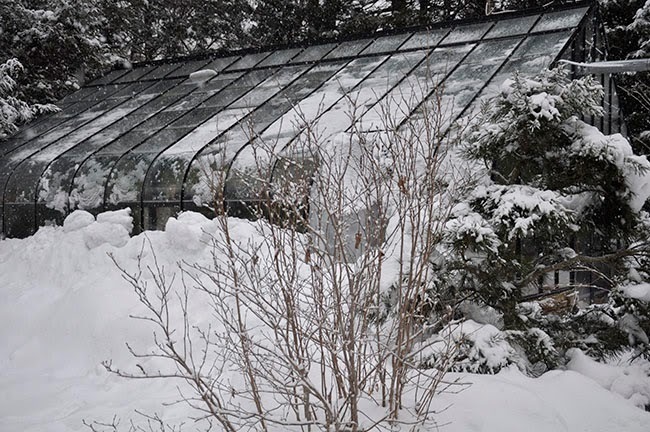 The light quality is pretty poor today, with heavy snow sliding off of the glass, but you can still appreciate the two orange flower spikes in the back. 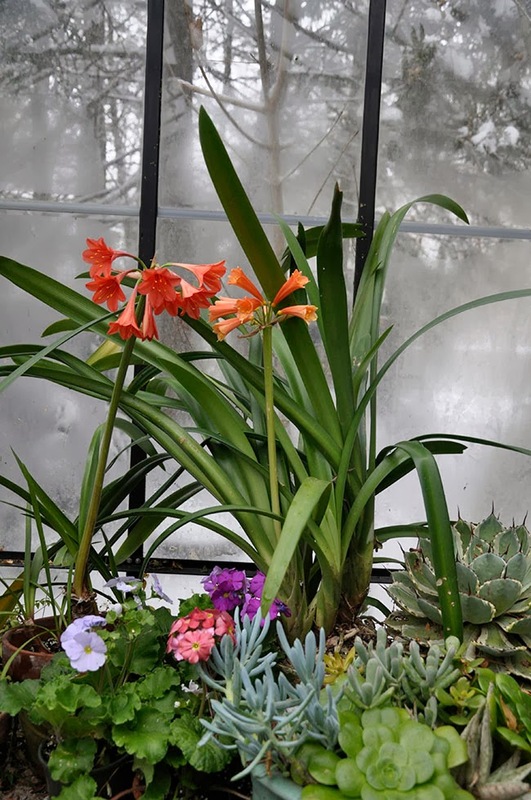 On the left, A Cyrtanthus x elatus and on the right, a Clivia x Cyrtanthiflora Group, which means that it is an interspecific Clivia with blossoms that are similar to a Cyrtanthus species. Clearly, so. A single spike of the Australian native Dendrobium specioum. My specimen has about 8 spikes this year ( I have not counted yet. This species can grow very large, and even though I am growing it in a 24″ orchid basket, I may need to have a basket custom made soon, as it is outgrowing this container. Another view of this enormous Dendrobium specioum.The foliage is a little damaged from sunburn, so there will be no hauling this beast to an orchid society judging weekend any time soon! I think I may move this plant next week, to a more central location in the greenhouse, where I can enjoy it at eye level. 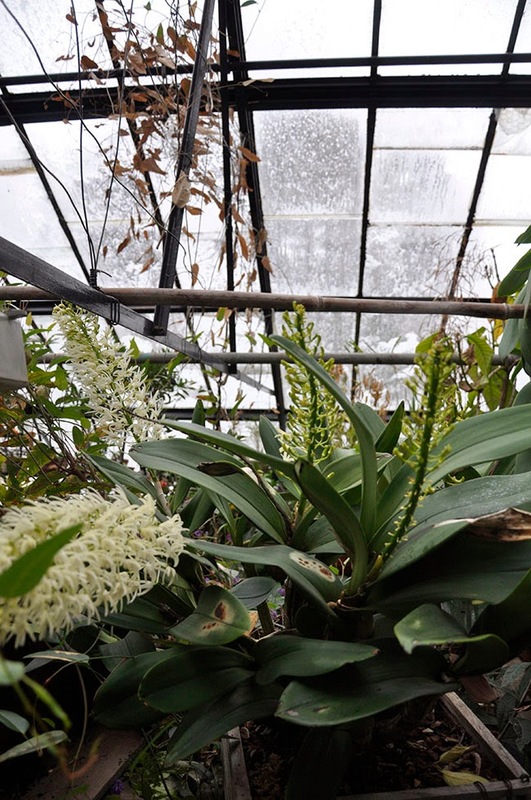 This is an orchid species that can handle cool greenhouse conditions, so it does very well in my greenhouse. 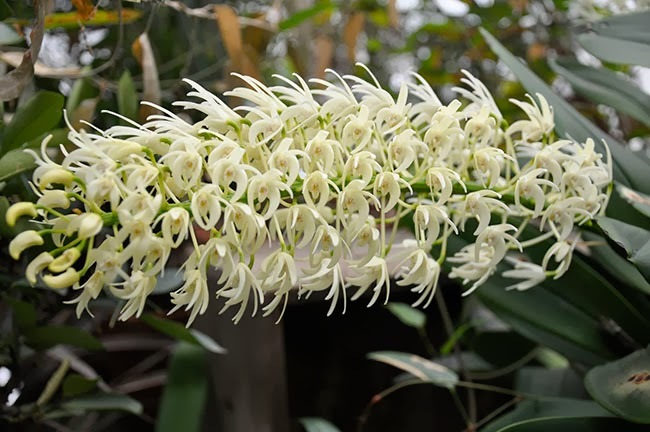 I had to climb up onto the potting bench to take the photo of the Dendrobium specioum so I thought that I would share this view looking down onto the back of the greenhouse. 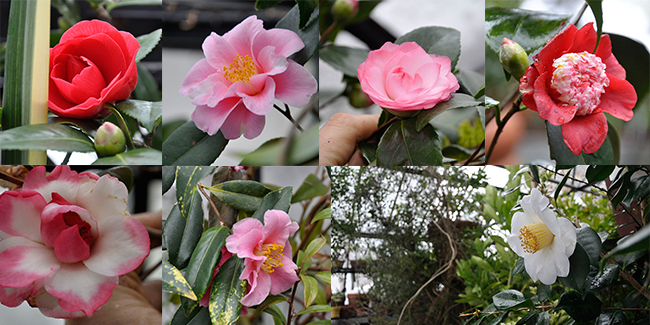 February is Camellia season under glass in New England. 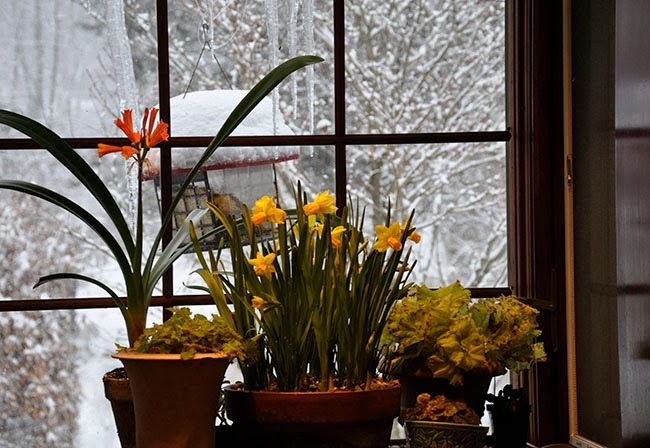 Here are a few varieties that are in bloom on this snowy day. Maybe I will pick a few to bring across the street to Elenore who is 89. It can be her Valentine’s gift. 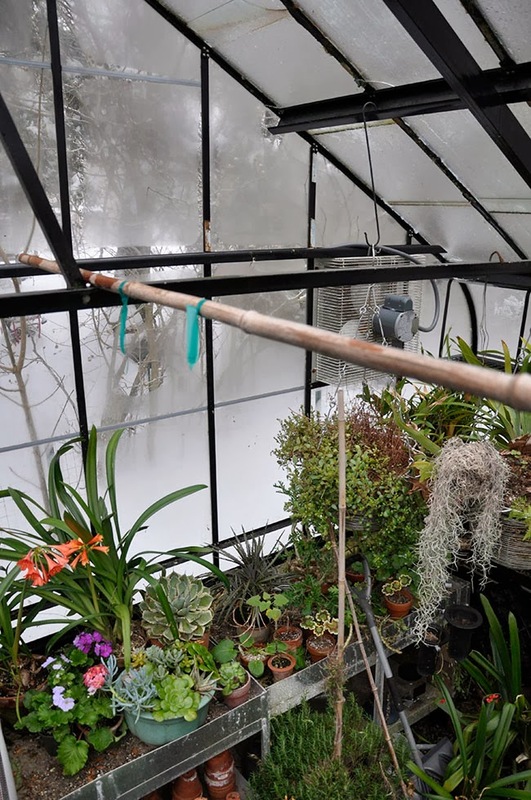 Here are some rarities for the serious plant collectors who might be reading this post. On the left, a deeply rooted summer dormant plant from the Caucasus, Asphodelus caulks. Its pink lily-like blooms are closed on this overcast, snowy day. 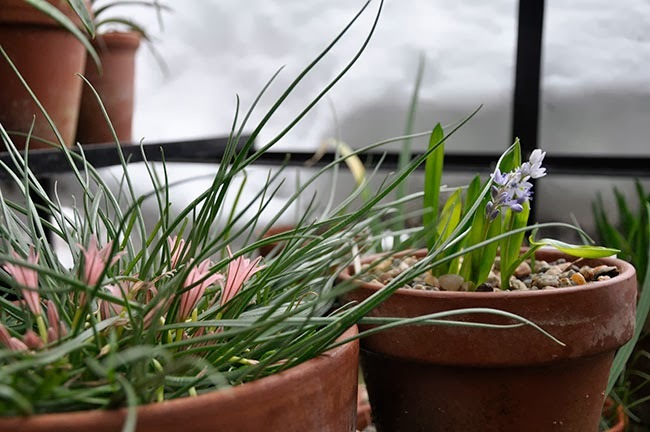 On the right, is a pot of a rare Scilla from Greece, Scilla aristides, which makes a nice alpine house subject. plant on the gravel. Feels like spring, even though it doesn’t look like it outside. The Magnolia stellata branches that I picked to force for my fathers birthday party, finally bloomed this week. 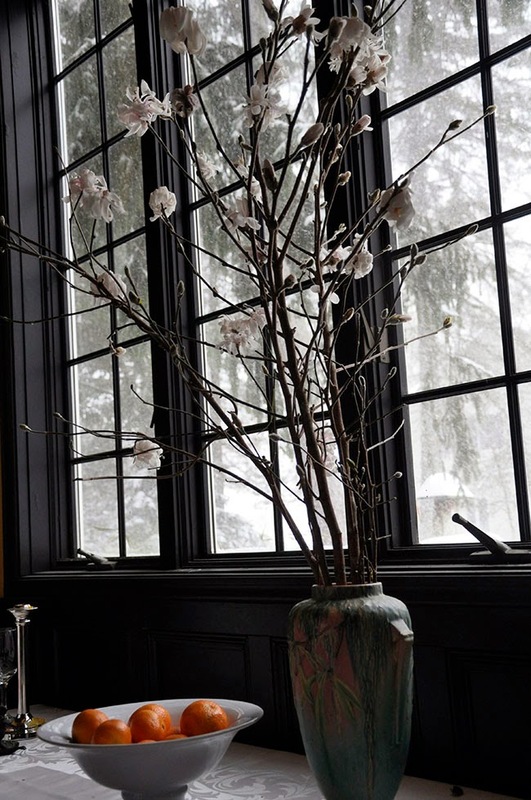 I really didn’t expect them to open on time, and their grey, fuzzy buds looks nice in the larger arrangements of forced branches, but now that they are opening, they are fragrant and so nice, brightening up the house on this snow day.